Remove root base and top leaves. Cut into half or quarters. Boil for 10 minutes. Serve buttered or with a mild cheese grated on top. Quarter and blanch in boiling water for 4 minutes. Cool and pack in freezer bags. May be cooked from frozen in boiling water for 5-8 minutes. 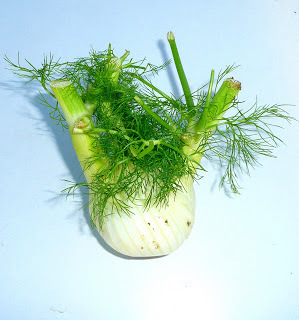 Remove root and separate fennel into leaves, cutting each in half across. Blanch for 5 minutes in boiling water. Layer fennel leaves with half the cheese in a greased oven-proof dish. Pour over cream, sprinkle with remaining cheese and season to taste. Bake at 200C/Gas Mark 6 for about 20 minutes. Serves 4. Fry onions gently until very soft. Add fennel and potatoes. Fry for further 5 minutes, covered, stirring frequently. Add stock and simmer for 20 minutes. Season, puree and add cream. Reheat without boiling. Scatter chives to serve. Serves 4.